TranspondersTiming tot duizendste van seconden! Geen discussie meer over het aantal afgelegde ronden, geen discussie meer over de winnaar, met onze transponders registreren we tot op 3 cijfers achter de komma. 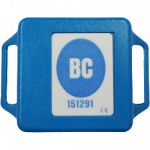 The BeChronized ProActive Transponder is a battery-powered transponder suitable for all active sports like road cycling, track cycling, BMX, mountain bike, inline skating, running, walking, cross-country skiing and much more. Thanks to its Lithium battery the BeChronized ProActive Transponder has a lifetime expectancy of 100.000 passings and does not require any recharge. This contributes to an eco- and user-friendly solution. Furthermore, this small and lightweight transponder is easy to fix to the ankle or bike, and can be placed in the optimal position for readability and comfort. Simplicity, accuracy and reliability are all captured in this small device, the BeChronized ProActive Transponder.